Leicester South is located in Leicestershire in the centre of England. The seat was created in its current form in 1974. The current member of parliament is the Labour Party’s Jon Ashworth who has served since the by-election in 2011. 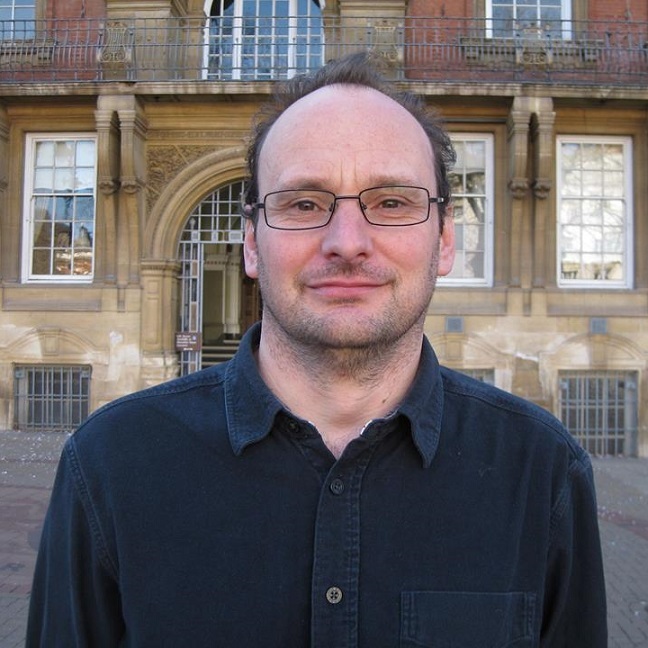 I am Andrew Walton, the TUSC candidate for Leicester South. I have lived in the constituency for the last 20 years, and work locally as an administrator in an NHS hospital. I am a trade union steward, in UNISON. I went to state school, and then completed a degree at Leicester University (in the days when there were still student grants). I joined the Socialist Party (which is part of TUSC) in 2004, angry at the Iraq War and wanting to make a difference for ordinary people where I live. I am not a professional politician – I went into politics because I felt I needed to stand up and be counted, and to fight for socialist ideals – not as a career choice. I would not take the full MP’s salary of £67,000 and would instead live on the average wage of a worker in my constituency. The difference would be given to good causes, e.g. campaigns against government and cuts being carried through by the New Labour Leicester council locally. I would listen to the concerns of my constituents, and stand up for the interests of local people, unlike politicians from the main parties, who are more interested in listening to lobbyists for big business. I am in touch with the concerns of ordinary workers. TUSC is the only party whose candidates are completely opposed to austerity. We would put in place policies to benefit the many and not the few at the top. The free market is failing to build the homes we need or stop the energy rip-off. It’s creating the super-rich while most of us are made to struggle and it’s giving us politicians who buy into the greedy ‘look after yourself’ mentality. I am standing against this, for socialist policies. Jonathan Ashworth may have had some good intentions, but ultimately we need radical change, not a Labour Party which has betrayed ordinary voters: with policies that are “Tory-lite”, and which which has broadly signed up to Tory budget plans. Austerity has failed. There is no need to cut public services, benefits, jobs or the NHS in order to reduce the deficit. If we reclaimed the £120bn back which is evaded or avoided in tax each year by the wealthy and big corporations, this would help provide decent public services. As far as the “recovery” is concerned, it has not been felt by the working class: rather the wealthiest have seen their fortunes increase, while the majority of people are either on zero-hour contracts or are low paid, in precarious employment. TUSC campaigns for a £10 an hour minimum wage, now, with no exemptions. The Leicester Mercury recently exposed the conditions of thousands of workers in the textile industry in this city, living on just £3 an hour. Employers hire, often migrant workers, whom they think they can get away with paying the least, and then try to lower all our wages in a ‘race to the bottom’. We can stop the employers dividing us by getting organised to fight for decent wages and conditions for all. Migrant workers play a crucial role keeping our public services running. At the same time government cuts are destroying our public services, schools and homes – this can cause resentment, driven by attacks on immigrants by right-wing tabloids. As a trade unionist, I think we need a united campaign for homes, public services and jobs for all. Some council workers haven’t had pay rise in 10 years while the cost of living has soared. The wholesale price of oil has gone down, but this has not been passed on to the consumer. By renationalising the utilities, this would save money on household bills. We also need to invest in cleaner, greener energy, from renewables. TUSC campaigns for rent controls, to stop private landlords taking advantage of the lack of supply and ripping off tenants. We also need to scrap Thatcher’s notorious anti-trade union laws, which are some of the most restrictive in Europe. The NHS should be returned wholly to public ownership. PFI contracts should be scrapped and private companies should have no part in running our health service. The NHS should return to being what it once was – a comprehensive healthcare service, “from cradle to grave”, free to all who needed it and funded through central taxation. The Tories’ Health and Social Care Act has handed over a huge part of the NHS budget to private companies – it needs to be scrapped. However, New Labour started the ball rolling, by introducing Foundation Trusts, which can go bankrupt or be taken over by businesses. Only TUSC, as socialists, can be trusted to defend a public NHS. Likewise, pharmaceutical companies should be nationalised and run to meet the needs of patients, not shareholders. There is as a 12-15 year difference in life expectancy between wealthier and poorer areas in Britain. Social change and a more equal society itself will also generate better health. We need more jobs to build social housing, hospitals and schools, to improve public transport and to increase social care. We would share out the working week, reducing workers’ hours with no loss of pay. This would allow people to work and have a life outside work. We would pay for this by introducing a levy on the £800bn that British big businesses are refusing to invest in the economy, and we would close tax loopholes and put an end to tax havens. There are too many public-school educated politicians in Parliament. There are not enough working-class women and men representing ordinary people, and in touch with their concerns. Our first-past-the-post electoral system is not the most democratic – we need a voting system which fairly reflects the different politics and types of people that make up the population. I would vote to exit the EU, on socialist policies. The EU is a bosses’ club, and the real decisions are made behind closed doors, by the troika and the Council of Ministers – unelected bureaucrats. We need international co-operation between workers from across Europe in order to change society – I oppose racism and stand for solidarity between working people across borders.